A luxurious art deco inspired wedding invitation to get guests excited for the big day. Ana and Mike approached me to design the invitations for their wedding day; a grand art deco style affair taking place on New Year’s Eve. I worked closely with the couple to pick the perfect references to get started and eventually landed on a sense of Great Gatsby style sophistication. 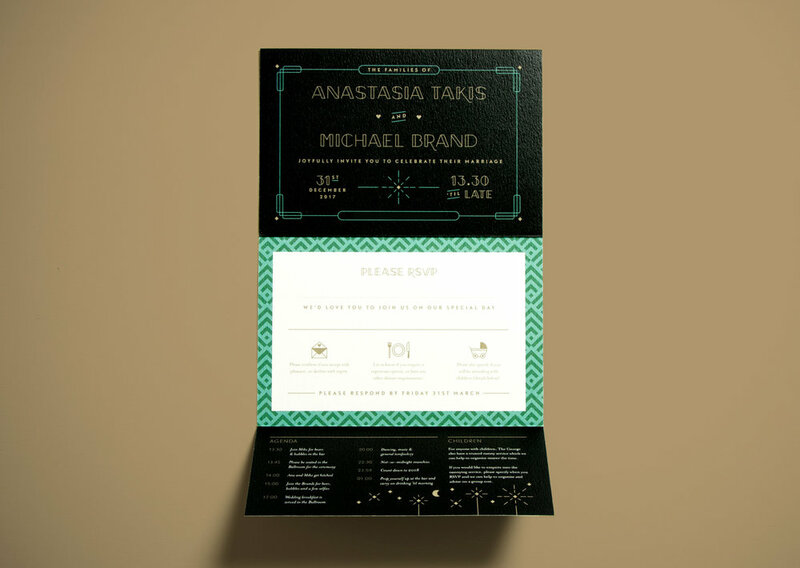 The final design was a three folded printed design, featuring custom typography, an art deco pattern, minimal illustrative iconography and lots of little touches to delight the guests, and give Ana and Mike a beautiful reminder of one of the most important days of their lives.